Ellora caves portray majestic artworks, made way back in 5th to 6th AD. Read on. The Ellora caves are a world heritage site, located 30km of Aurangabad in Maharashtra. Ellora caves are locally known as 'Verul Leni'. Ellora also happens to be the largest monolithic excavation of the world. Ajanta Caves and Ellora Caves are famous world over for paintings and rock sculptures. The history of Ellora caves goes back during the period of Stone Age. The caves are said to be the result of the volcanic eruptions. These caves are part of the Sahyadri range and must have been there for quite sometime, around 60 – 65 million years ago. There is one popular stream that flows through these hills, the Elanganga which overflows particularly in Monsoons. The rock sculptors made here in Ellora are a result of the use of fine multi–coarse grain like rock which must have emerged due to volcanic flow all these years periodically. There are around 34 monasteries and temples which are dug into the deeper sides of the cliffs. The world famous structures are divided into three categories, 5 Jain caves, the 17 Hindu caves and the 12 Buddhist caves. Each categories display elaborated artifacts relating the beliefs, faith and traditions of each religion respectively. These caves are founded roughly during the 5th to 6th century AD. It is said that many Ajanta Caves were lost or dilapidated. But this never happened with Ellora, as no caves were ever lost. 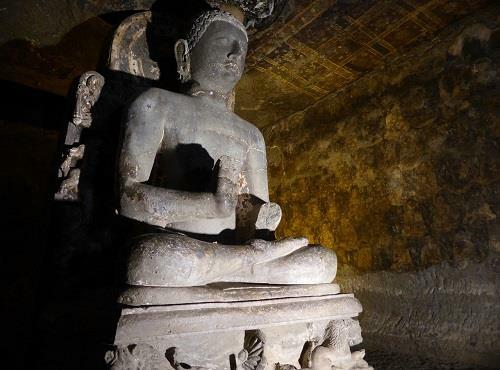 If the artifacts and sculptors of both the caves are compared, then it is definitely a proven fact that the Ellora paintings and artifacts are far more representational and gigantic. It is a true masterpiece, which portrays the painstaking skills and efforts that went in building this three storeyed wonder. Ellora caves are its best during monsoons, as the stream overflows and break out into waterfalls which flow and fall through caves adding up to the beauty of the existing structure.